A smart fridge that prevents drinks from disappearing by selectively allowing access to people you want. Have you ever had your friends over, only to find your fridge mysteriously empty hours later? 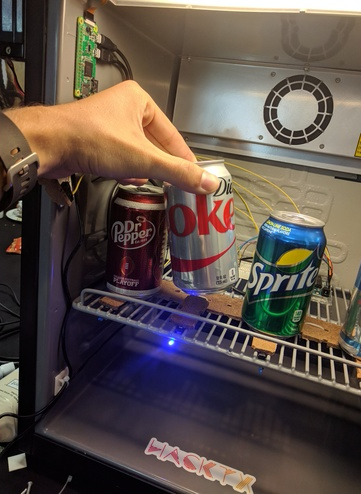 Hacking a Cold One is an 'Internet of Things' smart fridge created in order to alleviate this issue. The fridge manages inventory, access, and transactions through a combination of different technologies to solve this problem! 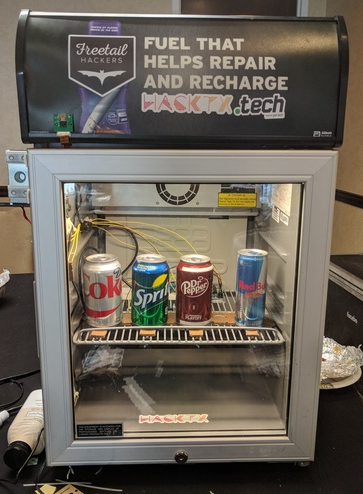 Hack a Cold One is a IoT smart fridge. 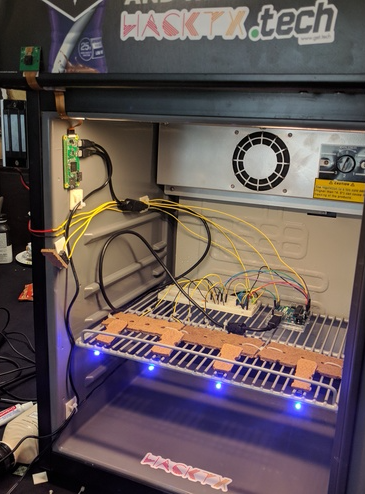 A Raspberry Pi is used as the central control unit for the fridge connected with a plethora of sensors through an Arduino Uno and a camera module. The Uno uses digital I/O pins to connect to the four switches beneath the drinks, and acts as a digital switch for the electromagnetic switch. The Raspberry Pi communicates with a middle tier server hosted through a web tunnel on our laptop. The mid tier manages all the information about units and door lock information, and returns information to the Pi and the front-end created in Angular. The front-end client will manage Capital One API calls (used for payments processing) that are synced with the Raspberry Pi. We use MongoDB to store all details about our inventory which is then displayed on the client.